And, now, the last in our special Leap Friday focus on Park Slope retail & restaurants. 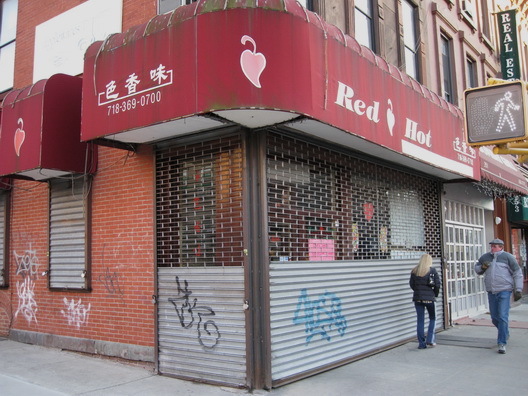 Whatever happened to Red Hot Szechuan, the latest restaurant on Seventh Avenue to kick the bucket, appears to have occurred very quickly. (As in, everyone took off running for their lives.) 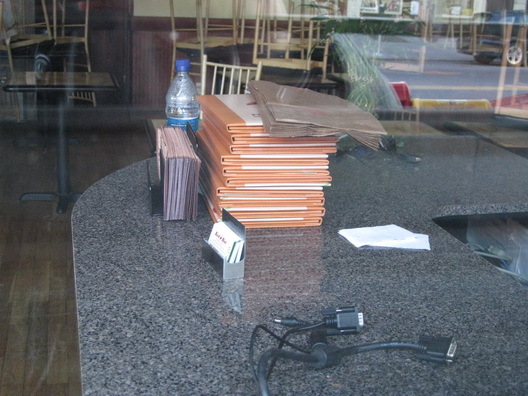 A look inside reveals menus still stacked on the counter and cables where computer equipment was disconnected. The "specials" sign is still in the window as are the Chinese New Year's decorations. In a related development, Hunan Delight on Union Street has added three delivery people and a satellite kitchen on Seventh Avenue. Just kidding. whay are we caring about this..
Hey, you may not care, but we care. Dude, where's my Chinese delivery? I care! A Hunan Delight on 7th, that's a great idea. Hunan Delight is, as promised, delightful. No. 1 Garden on PPW is pretty good and inexpensive. But I will miss Red Hot's very satisfying Hot and Sour Soup. Seriously. If you ever ordered from Red Hot, you'd know. Best Chinese delivery I've ever had. This blows. I care because it's bizarre that a restaurant that has done a brisk business for years has gone belly up so suddenly. There are a lot of empty store fronts on Seventh, but all of those closings have made a certain kind of sense. This one doesn't. How is this possible? The vegetarian menu was so yummy... no MSG, nothing was ever oily and gross... the veggies always so fresh... this is not cool. I want my Red Hot! I was in there a few days before they closed. Everyone looked like they had just got their pink slips. So looks like we are getting another Sushi place on 15th Street and 7th Avenue right across from Kiku (The Kiku take-out not eat-in). The new place is called TEN: Modern Japanese Cuisine. Hope they're okay. It was seriously the best Chinese in the neighborhood (in fact, spanning two neighborhoods - they delivered to Windsor Terrace). They always supported local charities, giving away gift certificates for fundraisers without fail. Shame. So much turnover on 7th Ave this year! Again, why are we caring about this..
MSG is coming to Brooklyn? I though we're already getting the Nets arena ... Charles Barkley's Center. Wow, this is sad news. I love this spot. Didn't realise it had closed. Anybody know why by now? Yes, please - if anyone knows why it closed down please share!! I will keep my fingers crossed that they will reopen or relocate. I no longer live in the neighborhood (I have been priced out as well) but would make special trips to 9th Street just to have their amazing fresh food. I miss you, Red Hot - especially your Schezuan Triple!! PS - if you don't care then don't waste our time with your unecessary comments. I loved this place. Best Chinese in the hood for sure. I've sinced moved from the Slope but my girlfriend makes me get her take out every time I'm back. Were they priced out? Health code violations? Whats the deal?